Online registration is not yet open. 5K is open to runners 18 years and older. Medals will be distributed following each race except the Open Race. Any runner, whether they are in a public school, home school, boarding school, private school or independent school, must run in the seeded race in order to qualify for the National Finals in San Diego. On Friday, November 24th between 4:00 pm and 6:30 pm, registration will be available for early pick-up at the Meet Headquarters. 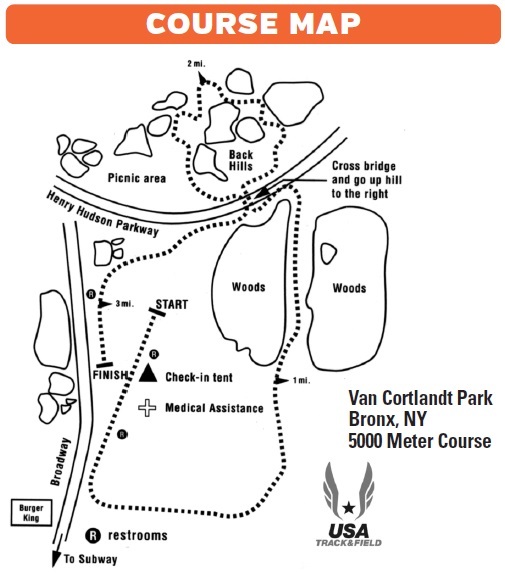 At Van Cortlandt Park (race site) Saturday, November 25th, race numbers will be available at the registration tent beginning at 8:30 a.m. and continuing until the last race. All runners receive a participant New Balance/Foot Locker Cross Country backpack and a meet program by showing their race numbers at the tent. The course is 5000 meters and consists of grass, dirt path and crushed rock. Spikes are permitted. The 3000 meter course for the age group races travels through the woods, up vault hill, down to the bridge, immediate left downhill to flats and right to the Broadway finish line. Athletes may participate in only one race. This 5000 meter race is open to runners 18 years and older who have completed high school eligibility in Open (ages 18-39) and Masters (40+) divisions. High school runners are not allowed in the Open Race. The top 20 male and 20 female runners in each division will receive medals and a New Balance/Foot Locker Cross Country backpack. Every runner in every race will receive a short-sleeved New Balance/Foot Locker Cross Country backpack and a meet program highlighting the previous 35 years of Foot Locker races, as well as previewing this year's race. The top 20 men and women receive medals in the Open and Masters race. about 15 minutes after crossing the GW Bridge. South, and then proceed to Broadway and make right, as above. When this page loaded, the official time was 8:04:56 AM EDT.